Preheat oven to 200˚F and line a sheet pan with parchment paper or a silicone mat. In a small pot, fill it with an inch of water and let it come to a simmer. In a bowl of a standing mixer, whisk egg whites, sugar, and cream of tartar. Place bowl over the small pot and whisk until the mixture reads 160 degrees. Whip with a stand mixer until stiff, glossy peaks form. Add in the vanilla and fold in ¾ c. mini chocolate chips. In a piping bag fitted with a plain tip, pipe half of the batter as 2“ round, flat bases and the other half as 2” round, domed tops. Bake in oven for about 30 minutes or until the cookies are firm and dry to the touch. In a bowl of a standing mixer with the whip attachment, add the heavy cream and whip on high speed until soft peaks are just about to form. Add the vanilla extract and sugar and whip on medium speed until stiff peaks form. Do not over whip! The cream will turn into butter. 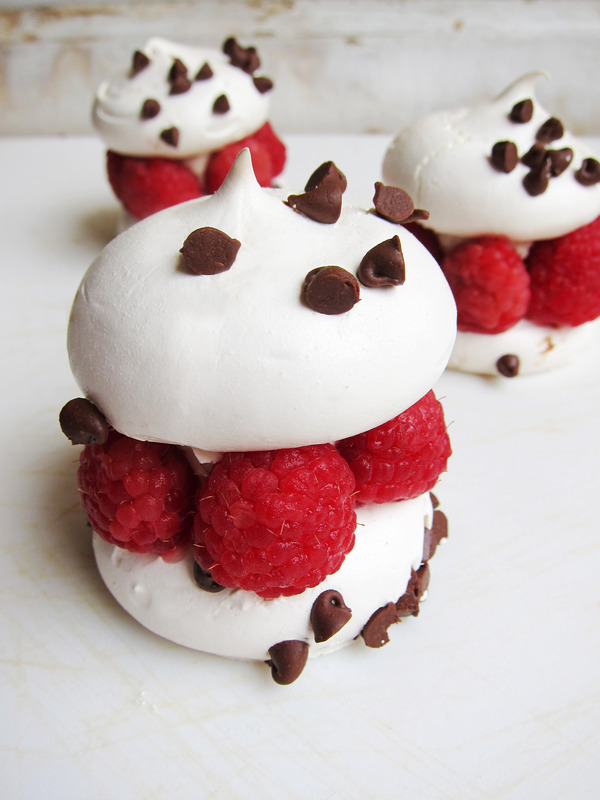 On a round, flat meringue cookie base, arrange raspberries around the circumference of the cookie. Put about 2 teaspoons of whipped cream in the center of the cookie. 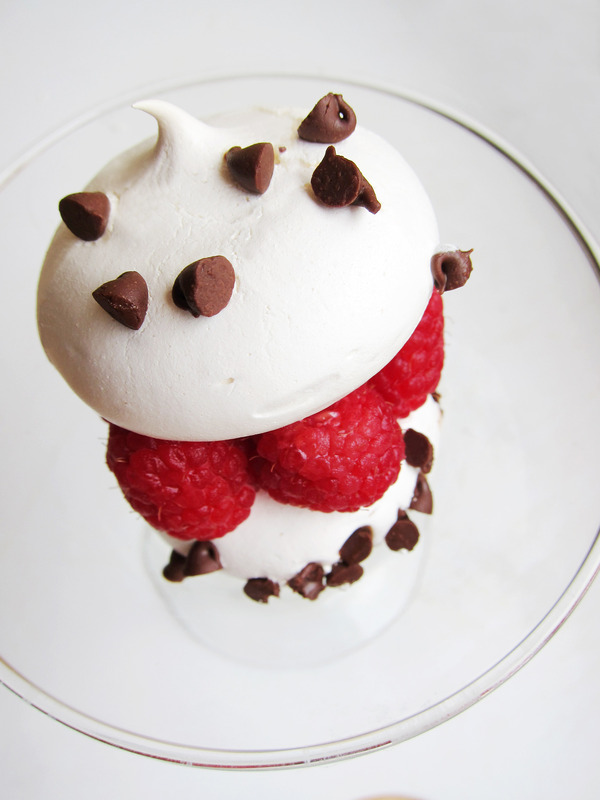 Finish with a domed meringue cookie top. This entry was posted in Chocolate, Cookies, Desserts, Fruit and tagged chocolate, Cookies, dessert, fruit, meringues, national chocolate chip day. Bookmark the permalink. These sound awesome! 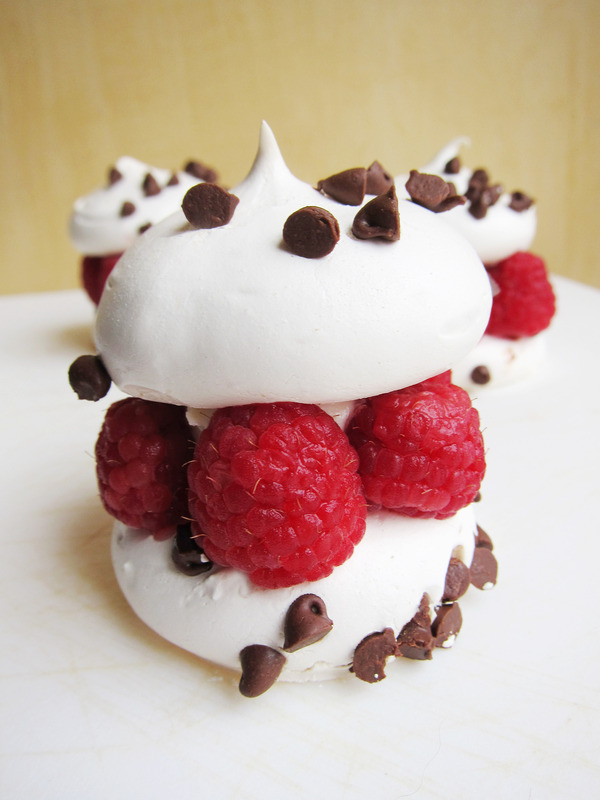 I’ve never loved plain meringues on their own, but when you add chocolate chips, whipped cream, and raspberries, I am so there! You are incredible with that spatula!! Can you make me this forever? Please?